Winchester Deer Season XP is specifically optimized for superior performance against whitetail, blacktail, and mule deer. 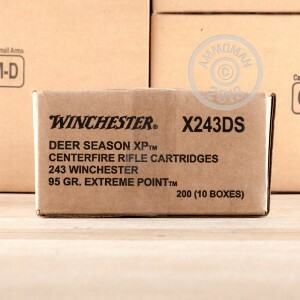 Each .243 Winchester cartridge in this box of 20 fires a 95 grain projectile at a muzzle velocity of 3,100 feet per second. The bullet features a highly aerodynamic profile for extended-range accuracy and a broad polymer tip and tapered jacket that contribute to high diameter expansion in the target. 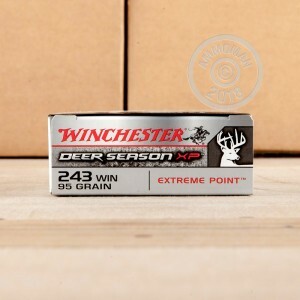 A well placed shot on a trophy buck is sure to get results with this ammunition! This ammunition is loaded in Oxford, Mississippi using non-corrosive Boxer primers and reloadable brass cases. 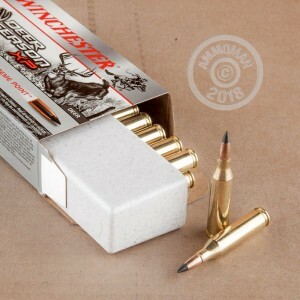 If you need a few different types of ammo, check out AmmoMan.com's selection of high quality domestic and imported brands. Remember, all orders over $99 come with free shipping!